Baking powder and yeast may have similar purposes in baking, but the way in which they work is very different. While both products are responsible for leavening baked goods, this is where the similarities end. Baking powder gets its power from a chemical reaction that produces air bubbles, whereas yeast is an actual living organism, producing gas from a biological reaction. The two processes are not similar at all, and the two products are not interchangeable in recipes. Yeast is a single-celled living organism that is actually a variety of fungus. When you purchase yeast for baking or brewing, it's usually in a dormant freeze-dried state that makes it more shelf stable. Yeast wakes up when mixed with some sort of liquid to rehydrate it, then it must be fed some sort of sugar to keep it alive. Sugar can come in many forms, from plain table sugar to agave syrup or honey, or even fruit juice. As the yeast metabolizes the sugar, it produces byproducts of carbon dioxide and alcohol. Baking powder is comprised of an acid and a base. Think back to elementary school science, when you mixed baking soda with vinegar. Baking powder is essentially made up of baking soda and one or two powdered acids. When liquid is added to the mix, the base and acid dissolve and mix to form a chemical reaction. In this type of reaction, the acid and bases mix to give off carbon dioxide gas bubbles, water and salt as by-products. In double-acting formulas, heat is needed to allow the second acid to dissolve, which gives the baked goods one more burst of leavening in the middle of cooking. Baking soda produces and almost instantaneous reaction, then it fizzles and neutralizes. This means that baked goods must be cooked relatively quickly to capture the bubbles in the leavened product. 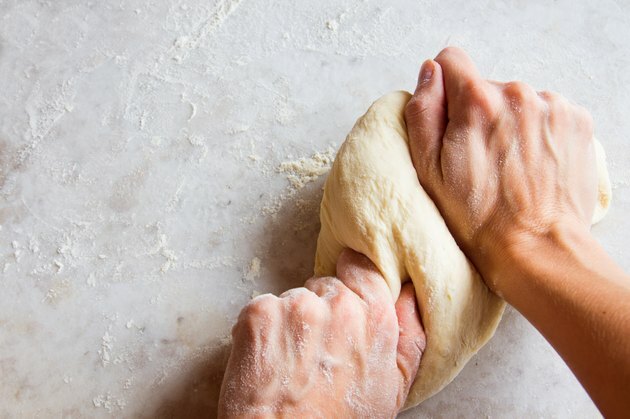 It also means that if the dough is heavy, it won't produce as good of a rise which is why quick breads aren't kneaded to produce elastic gluten. Yeast, on the other hand, reproduces and makes air bubbles in the dough much more slowly. The bubbles are stronger and keep growing, so it works well with the heavier dough of kneaded breads. Yeast doesn't stop reproducing and making air bubbles until it is killed with heat or lack of food. Yeast also has the added perk of making alcohol as a byproduct so it's used in making beer and wine -- something that baking powder could never do. Yeast grows best between 80 and 90 degrees Farhenheit, so keep dough in this range for the best rise. Yeast is killed at 130 F, so keep this in mind when using hot ingredients in dough. Double-acting baking powder begins a second chemical reaction with heat, so more rising action will happen as the cooking temperature rises until the dish is cooked. Alcohol produced by yeast for baking bread is negligible and bakes out during the cooking process.